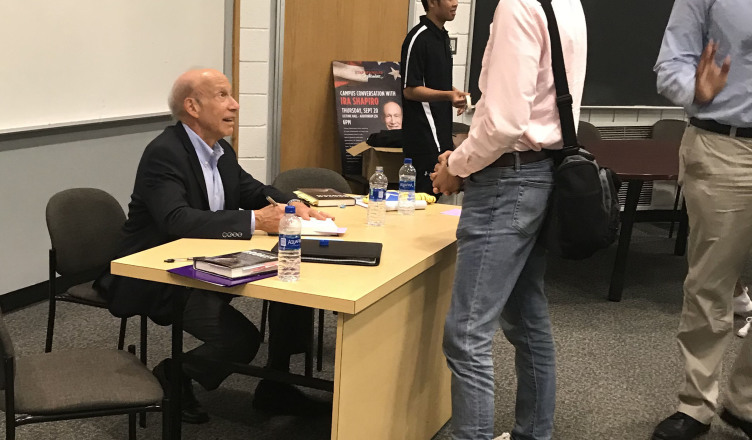 Author and International Trade Lawyer Ira Shapiro spoke during a “Campus Conversation” Sept. 20, which was hosted by the department for Civic Engagement and Social Responsibility. Shapiro started the conversation by addressing why he has passion for speaking to student audiences. Shapiro noted that his book, which is about the Senate, is because he “has something of a fixation about the Senate.” Shapiro interned at the Senate right after college, which he said gave him an idea of how to contribute to public service. Shapiro noted that the system of government has been facing a “long break down,” which he said Donald Trump was a product of. “The Trump presidency could either cause a destruction of our democracy, or the resurgence of it,” Shapiro said. The gradual decline of the politics of the Senate has been happening since the 90s, according to Shapiro. He continued to talk about leaders, specifically noting Senator Mitch McConnell. “I have written and believed that McConnell is a unique figure in our politics,” Shapiro said. Shapiro continued to discuss the issues regarding checks and balances of the Trump presidency, where the country needs the Senate the most. “The thing that’s most worrisome about the decline of the Senate is that at a time we need the Senate to be at its strongest, it’s actually been at its weakest,” Shapiro said. After Shapiro finished his discussion, Political Science Professor and Faculty Director of the Honors College Doctor Alison Rios Millett McCartney along with Civic Engagement Fellow junior Sophie Bertrand sat alongside Shapiro for a panel discussion led by questions they curated and audience questions. This led to a question and response from Shapiro regarding the context of money and being involved. “I think that while politicians respond to contributors, they also respond to citizens who are involved. They do not neglect citizens,” Shapiro said. Audience questions were addressed following McCartney and Bertrand’s questions. Questions ranged from asking about Trump’s social media accounts to addressing Shapiro’s stance on term limits. Copies of Shapiro’s book were given out to students whose questions were picked to be answered on the panel. Bertrand regarded the importance of Shapiro’s message on a student body and what she learned from his book.